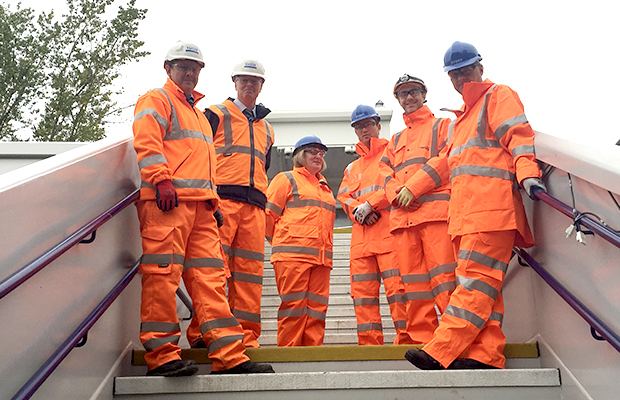 Story Contracting welcomed Mark Carne, Network Rail Chief Executive, to our Blairhill Station ‘Access For All’ scheme where he was given a presentation and tour of the project works. The 9 month project involves constructing a ‘step free’ access footbridge and lifts for the railway station as part of the Access For All programme – designed to improve access within stations for people with impaired mobility or travelling with children, luggage, cycles etc. Mark was notably impressed with the temporary works solution that was developed to facilitate access for the piling works, and by the use of a pre-cladding option for the lift towers to minimise work at height. Given the current limited access routes into the station, Mark was delighted to hear that the works were on programme to open to the public next month. “This scheme is going to be a significant and welcome improvement for the local community”. “Sincere thanks to you and the wider team again for all your efforts today. 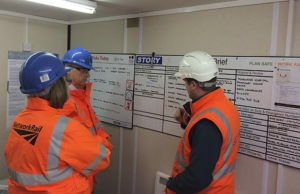 The exec team were impressed by the site and by the IP/Story collaborative framework generally”. Final works include commissioning the two lifts, with the step free access bridge opening to the public during November 2016.